All 48 basic taijutsu techniques from Shoden, Chûden, Sabaki and Okuden no kata. There is 12 basic techniques in each level. Together with Shirabe-moguri kata (not covered in this dvd) the school consists of total 60 dakentaijutsu techniques. Shortly after returning from 3 weeks training in Japan with Soke and the Shihan, Mats held this seminar. This DVD contains all 48 basic taijutsu techniques from Shoden, Chûden, Sabaki and Okuden no kata. There is 12 basic techniques in each level, together with Shirabe-moguri kata (not covered in this dvd) the school consists of total 60 dakentaijutsu techniques. Buy the full DVD here! and punch situations, and defences against kicks and punches. The Sabaki level is characterized by a shorter distance and foot work is even more important. In the Okuden kata the opponent starts to resist and do more counters. The opponent is attacking more freely. We try to get him in to a bad position and then apply a technique from the lower levels. In Shirabe-moguri kata (the last level, not covered on this video) the defender is now so skilled that he have developed the ability to feel what the opponent will try to do before he starts doing it. Kukishin-ryû is a very complete system, if you study the basic techniques well you will have a good defence system against any kind of attacks. On the Keiko #18 dvd, the whole Shoden no kata is covered in much more detail! 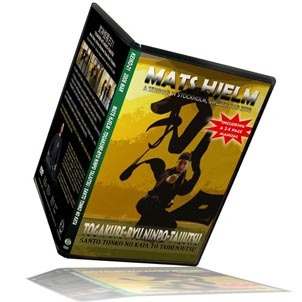 Mats Hjelm started training in Bujinkan for the first time around 1983, but it wasn’t until 1986 he had the opportunity to start training more seriously under a Shidôshi. He attends around 20 seminars, go to Japan 2-3 times every year. Since he started training he never had a training break. He takes his budo training very seriously! If you want to sponsor a seminar or course, please don’t hesitate to contact him. For more information see his web site www.kesshi.com Note! Click here for more information about our download files and how it works! Buy the full VCD here! The theme this year was Hontai Takagiyôshin-ryû and Daishô. Arne was in Japan in october, and Mats was in Japan november/december. They taught mostly Takagiyôshin-ryû techniques including… Ikichigae, Kasumi Dori, Onikudaki (plus 2 techniques we don’t know the name of), Sannindori, Omotegyaku ken sabaki and much more. The instructors speak Swedish on this video! A seminar in Kaigozan Dojo with Shawn Gray from Japan. The theme for this video is Hontai Takagiyôshin-ryu and Daishô. On this video he shares what Hatsumi Sensei had been teaching so far this year. He taught Ukemi, Ukemi applications, Suwarigata, and seven basic techniques from Takagiyôshin-ryû, with various henka including wearing the Daishô (short and long sword). Shawn left behing 10 years of Karate and Kendo to begin Bujinkan training in Canada after returning from a 1-year stay in Japan in 1990. After a training visit in 1995, he relocated to Japan permanently in January of 1997. Shawn passed the godan test in January of 1999, and in 2000 at the urging of Hatsumi sensei established a dojo, the first Bujinkan dojo in Japan led by a civilian foreigner. Shawn has regularly served as interpreter for Dr. Hatsumi and has translated much of Senseis writing into english. He has been regularly invited to give seminars in Europe , North America , and Asia. The theme for this video is Koteki Ryouda Juppou Sesshou no Jutsu – (Kunai, & Basic Taijutsu). Shawn taught the first four Kunai Kata (Kiri no Ichiyou, Mizu-tori, Rakka, Mawashi- dori) from Koteki Ryouda Juppou Sessho no Jutsu (the 2003 Bujinkan theme). He also taught Taihenjutsu Ukemi, Sanshin no Kata and Kihon Happou applications and more. 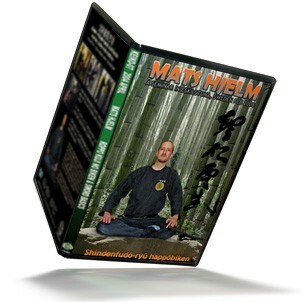 There is a bonus segment with the last and fifth kata, Gorin Kudaki by Mats Hjelm. 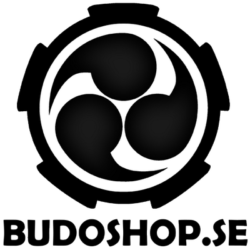 This is the 4’th seminar with Mr.Shawn Gray at Kaigozan Dojo in Stockholm Sweden, and the second this year. This time he taught many techniques which he has trained in Japan since his last visit in March. Koteki Ryouda Juppou Sessho no Jutsu (the 2003 Bujinkan theme). Ukemi, Taijutsu, Kunai, Kodachi and Kyoketsushoge. The theme for this video is Hontai Takagiyôshin-ryu and Daishô. Shawn taught Ukemi, Ukemi applications, Takagiyôshin-ryû Oikakedori (Omotegata), Yui Gyaku (Omotegata), Onikudaki (Sabakigata), Fuu Setsu (Shirabegata), Gyaku Dori (Shirabegata), Gokuraku Otoshi (Mogurigata), Onibuse (Mogurigata), Inazuma Dori (Mogurigata) and various henka including wearing the Daishou (short and long sword). This years theme was Shindenfudo-ryu Dakentaijutsu Happobiken, Taijutsu & Sword – (Bujinkan sword basics & advanced). Including various applications to different situations (henka). Note: The instructions was in English. Available as download or full DVD! This movie contains all 12 techniques from the Shoden kata level of Kûkishin-ryû dakentaijutsu. There is also a few sword techniques and drills, plus extra material showing how to put on the yoroi (samurai armor). Shortly after returning from 3 weeks training in Japan with Soke and the Shihan, Mats held this seminar. He taught the Shoden level, here we learn how to dodge attacks through a series of throwing attempts, grab and punch situations, and defenses against kicks and punches. Kukishin-ryû is a very complete system, if you study the basic techniques well you will have a good defence system against any kind of attacks. 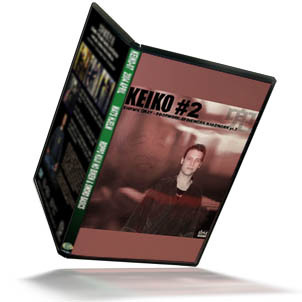 On the Keiko#19 DVD, also the Chuden, Sabaki and Okuden levels is taught but with less details. The instructions is in English and there is some subtitles explaining things which is not obvious. Buy the full DVD, click here! Kukishin-ryû Rokushaku Bôjutsu – Keiko Sabaki Kata Vol.1. This is the second seminar about the Rokushaku Bôjutsu (six foot staff fighting) and covers the first 10 basic waza from Kukishin-ryû Keiko Sabaki Kata. First the basics is taught, and then the technique is brought alive with realistic examples and responses from the defending opponent. The material from the seminar is 80 minutes and 10 techniques. Note: The instructions is in Swedish with sub titles in English. Note2: There is no manual with this video like previously in the Shugyou series. 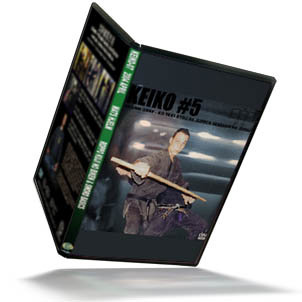 Note3: The DVD also includes a 20 minutes bonus material from a training with Yoroi (samurai armor). It includes ukemi with yoroi, Bojutsu against the Yoroi, and unarmed fighting against the Yoroi. As download you can buy just this one if you want. Available as download or full DVD & Manual! The focus on this video is the basics of Rokushaku Bôjutsu (long staff), included is basic exercises such as Sanshin no Kata with the Bô vs Bô, Taihenjutsu-ukemi, rolling in all directions and using the long staff. The nine basic Kamae (body postures) is covered in detail. Kihon uchi waza, basic striking and thrusting with the staff is explained. Also all the basic Kihon Kata is taught. This is a good DVD if you want to learn the basics behind the actual Kata techniques. This download video also comes with a 24 page manual, 55 pictures as a compliment to your training. All the technique names with kanji and romaji, the techniques are briefly described with comments by Mats Hjelm. We also put in 30 minutes extra “Gyokko-ryu Bojutsu“, filmed in Kaigôzan Dôjô late March 2005, using the Rokushaku-bô in short distance with Taijutsu feeling (Sanshin no kata, and Kihon Happô). Note: The manual is in English, but the instructions on the DVD are in Swedish! with Swedish & English subtitles. The 24 page manual includes 55 pictures, descriptions and notes of the basics. All techniques with japanese kanji. The DVD is 110 minutes and only available in NTSC. This movie contains all 9 techniques from the Togakure-ryû Santo Tonko no Kata. The strategy of the fleeing rat is a collection of 3×3 techniques for quick self defense and then flee away safely. Also included on this movie is Sanshin no kata using a hidden knife, plus many taihenjutsu (breakfalling) techniques and training drills. Included is also a 24 page pdf booklet with the Santo Tonko techniques. This movie deals with Batto (quick drawing the sword), Ukemi (breakfalling with a sword), Sword Kamae, and Sword techniques. There is many basics and more advanced techniques, training drills and more. The instructions is in Swedish, but the instructions is very visible and clear. But we included a 4 page transcript, comments and descriptions in English. 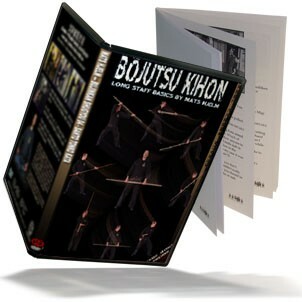 This DVD contains all the nine basic sword techniques from Kukishin-ryu Bikenjutsu Kata plus the Sayugyaku techniques. They are taught and explained thoroughly as a basic foundation, and then with many applications and variations. Shortly after returning from training in Japan again with Soke and the Shihan, Holger held this seminar in Kaigozan Dojo, Stockholm, Sweden. 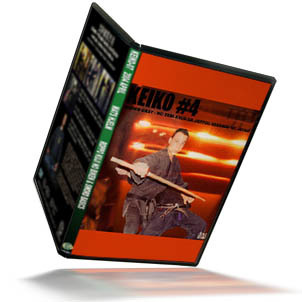 This DVD contains all the nine basic sword techniques from Kukishin-ryu Bikenjutsu Kata plus the Sayugyaku techniques. They are taught and explained thoroughly as a basic foundation, and then with many applications and variations. The techniques covered on this DVD is the following. All these techniques are explained and taught in detail. 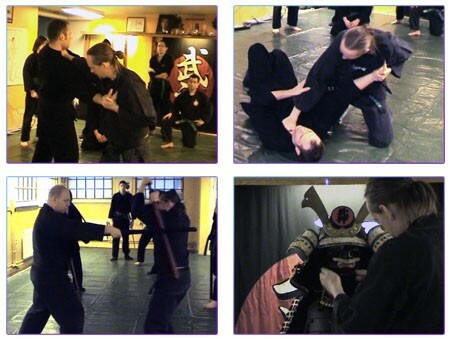 Holger’s main interest in Bujinkan is the basics. And he has become quite famous for his excellent taijutsu and very good knowledge and skill of the basics in Bujinkan. This movie contains all 18 basic taijutsu techniques from Koto-ryu Koppojutsu Shoden no Kata. They are taught and explained thoroughly as the basic foundation, and with many applications and henka. Approximately 90 Minutes playing time. Kurai-dori (kamae). Yokuto, Ogyaku, Koyoku, Shito, Hosoku, Hoteki, Shato, Keto, Sakugeki, Tangeki, Batsugi, Setto, Shihaku, Kyogi, Kakko, Uranami, Tenchi and Katamaki. This DVD contains all 12 basic taijutsu techniques from Gyokko-ryu Kosshijutsu Joryaku no maki. They are taught and explained thoroughly as the basic foundation, and with many applications and henka. The instruction is in English approximately 120 Minutes playing time. This is the first Taijutsu level in Gyokko-ryu and a very important if you want to learn the Bujinkan Budo Taijutsu system. All these techniques are explained and taught in detail. The DVD has menus where you can chose technique to see, completely with chapters.